Mon-Fri. 8:30 a.m. - 5:30 p.m.
Evinrude E-TEC sets the performance standard for outboard engines. Auto-Storage: The auto winterization feature fogs the engines itself in minutes, with no trip to the dealer. An Evinrude E-TEC engine does not require belts, camshafts or exhaust valves, which means there are fewer parts to wear down or malfunction than a four--stroke outboard. Extend the life of your outboard and your boating season. More Miles Per Hour: Get even more extra miles per hour with the Straight Leading Edge gearcase. 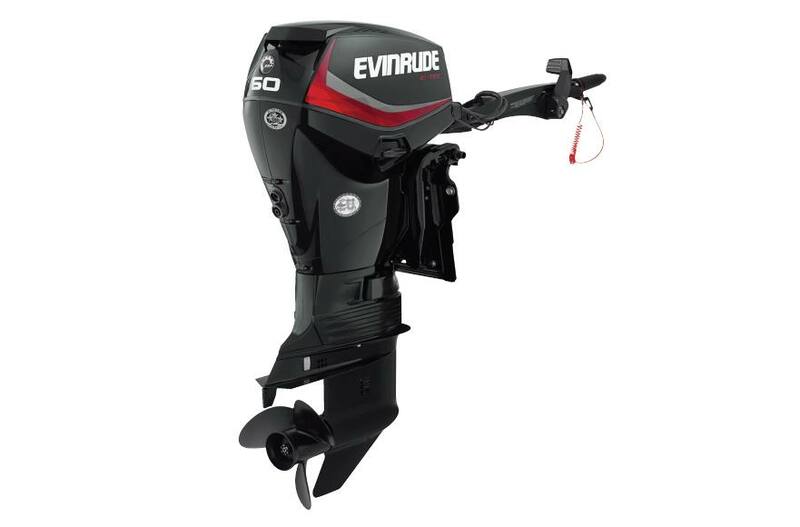 The Evinrude SLE gearcase features high-efficiency water pickups and a weed-slicing shape up front, for a cooler-running engine and ultimate durability and reliability in the long run. Engine Type: Inline 2-Cylinder E-TEC D.I. Variable Voltage Computer Controlled 81 Amp. Current amp calculated at 13.5 V. Net dedicated battery charging power output is 25 Amp. 5 full years of factory backed, non-declining, fully transferable coverage. Spring into savings by making less of a dent in your bank account with up to $2000 rebate. Make more memories on the water knowing we’ve got your back. With an Evinrude E-TEC G2 you will never compromise. And with five year factory backed coverage, it's just another reason for you to spend time on the water. Offer valid only to qualified buyers on purchases of engines bought for recreational use only. Excludes engines purchased under commercial, professional, and government programs. 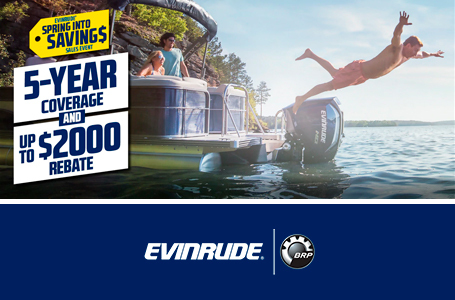 Offer is valid in North America only on new and unused Evinrude E-TEC® engines purchased, delivered and registered between 4/15/19 and 6/30/19 at an authorized, participating Evinrude dealer. *5-YEAR COVERAGE: Subject to all exclusions, limitations of liabilities, and all other terms and conditions of BRP’s standard limited warranty and B.E.S.T. contract, including without limitation the exclusions of damages caused by abuse, abnormal use or neglect (see B.E.S.T. contract for specific details of coverage and exclusions). Offer effective on all new and unused 15 H.O. and above Evinrude E-TEC outboard engines. Eligible models will receive 5-year coverage (3 years of BRP Limited Warranty and 2 years of BRP Extended Service Terms [B.E.S.T.] coverage) subject to a $50 deductible on each repair. Benefit offered to Florida residents is a 5-year BRP Limited Warranty. Evinrude Jet Series engines are eligible for 5-year coverage offer on the upper unit only. The jet pump assembly will only receive a 3-year BRP limited warranty. Offer subject to change without notice. **UP TO $2000 REBATE: Offer effective on all new and unused 40 HP and above Evinrude E-TEC and E-TEC G2 outboard engines. Based on horsepower, consumer will receive a discount which is to be denoted on the bill of sale, off of the purchase price agreed upon with qualified, authorized Evinrude dealer. Rebate amounts are as follows: $2000 rebate on 200 H.O.–300 HP models, $1000 rebate on 150 H.O.–200 HP models, $500 rebate on 115 HP–150 HP models, and $300 rebate on 40 HP–90 H.O. models. See your authorized, qualified Evinrude dealer for details. Terms and conditions apply. Offer may not be assigned, traded, sold or combined with any other offer unless expressly stated herein. OFFER VOID WHERE RESTRICTED OR OTHERWISE PROHIBITED BY LAW. Our ten full years of factory backed, non-declining, fully transferable coverage - just got better! You want lower emissions. But not at the expense of power. You want performance. But you don’t want to sacrifice easy handling. With an E-TEC G2 you will never compromise. And with ten year factory backed coverage, it's just another reason for you to spend time on the water. Offer valid only to qualified buyers on purchases of engines bought for recreational use only. Excludes engines purchased under commercial, professional, and government programs. 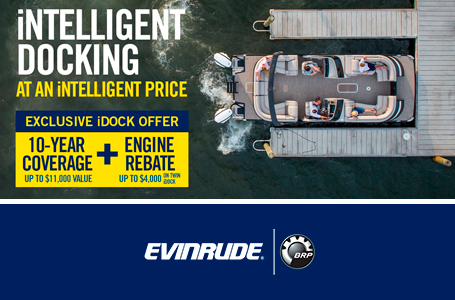 Offer is valid in North America only on new and unused Evinrude E-TEC engines purchased, delivered and registered between 4/15/19 and 6/30/19 at an authorized, participating Evinrude dealer. *10-YEAR COVERAGE: Subject to all exclusions, limitations of liabilities, and all other terms and conditions of BRP’s standard limited warranty and B.E.S.T. contract, including without limitation the exclusions of damages caused by abuse, abnormal use or neglect (see B.E.S.T. contract for specific details of coverage and exclusions). Offer effective on all new and unused 15 H.O. and above Evinrude E-TEC outboard engines. Eligible models will receive 10-year coverage (3 years of BRP Limited Warranty and 7 years of BRP Extended Service Terms [B.E.S.T.] coverage) subject to a $50 USD deductible on each repair. Benefit offered to Florida residents is a 10-year BRP Limited Warranty. Evinrude Jet Series engines are eligible for 10-year coverage offer on the upper unit only. The jet pump assembly will only receive a 3-year BRP limited warranty. **VALUE UP TO $11,000: Approximate retail value of 5 years BRP Extended Service Terms coverage is based on number of HP and is up to $11,000 USD for two (2) E-TEC G2® 300HP engines. †UP TO $4000 REBATE: Offer effective on all new and unused 150 H.O. and above Evinrude E-TEC G2 outboard engines. Based on horsepower, consumer will receive a discount which is to be denoted on the bill of sale, off of the purchase price agreed upon with qualified, authorized Evinrude dealer. Rebate amounts are as follows: $4000 USD rebate on twin 200 H.O.–300 HP models, and $2000 USD rebate on twin 150 H.O.–200 HP models. Offer subject to change without notice. See your authorized, qualified Evinrude dealer for details. Terms and conditions apply. Offer may not be assigned, traded, sold or combined with any other offer unless expressly stated herein. OFFER VOID WHERE RESTRICTED OR OTHERWISE PROHIBITED BY LAW. 8:30 a.m. - 5:30 p.m.